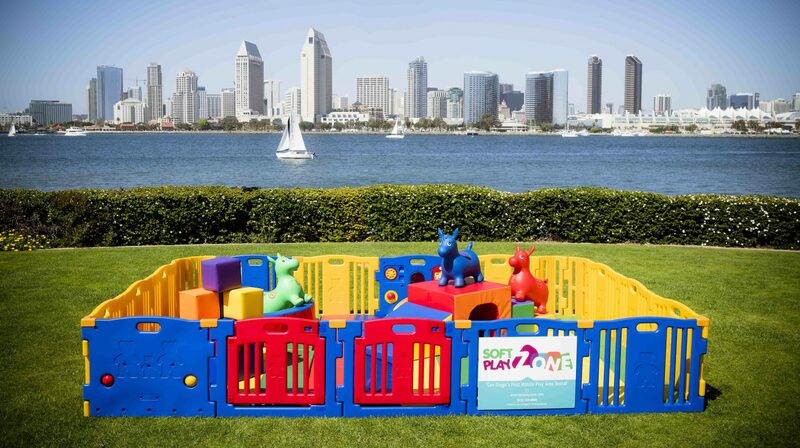 We offer two exciting Soft PlayZone rentals that will keep your little ones entertained. Price includes delivery fee, set up, cleaning and breakdown fees. Rentals are for 4 hours. If Soft PlayZone will be set up outdoors, we require a shaded area or tent to prevent the PlayZone to be too hot for your little ones. We offer a tent rental for an additional $25 fee. Fun Zone – Approx. 8′ x 8′. Price is $170 for 4 hours. Wow Zone – Approx. 8′ x 12′. Price is $240 for 4 hours. “SPZ was awesome! They kept the little kids occupied while the bigger kids had their activity…” -Mark T.
“It was the perfect play area for all the little ones who weren’t quite ready for the big kid playground…” -Jeanne C.